Smartphone ownership is ubiquitous, and most employees are bringing them to work, regardless of company policy. In the past few years, IT managers have tried various iterations of personal device policies: everything from an outright ban of personal devices to a wide open policy of Bring Your Own Device (BYOD). 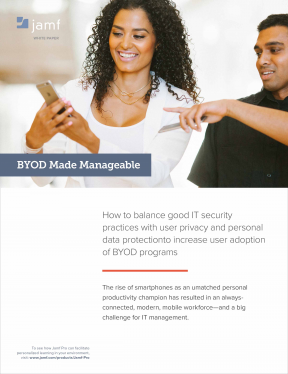 The success (or failure) of a BYOD program hinges on user adoption, requiring the right balance of IT control and personal privacy. This Enterprise Brief outlines a strategy for striking that balance and making BYOD work.